Have you ever noticed that salmon in the supermarket can vary in color from a dull pink to a bright red? That is why most health-conscious people go for wild salmon over farmed salmon in the supermarket. It’s commonly thought that bright red salmon is fresher and healthier. However, some companies use dye to achieve this bright look. That’s why you should always pay attention to where your fish comes from and how it was harvested. Astaxanthin is an antioxidant and anti-inflammatory compound found in microalgae, fungi, complex plants and seafood (1). It’s a bright red cartenoid that gives salmon it’s distinct color. Wild salmon eat astaxanthin-rich plankton, a luxury that farmers cannot afford. 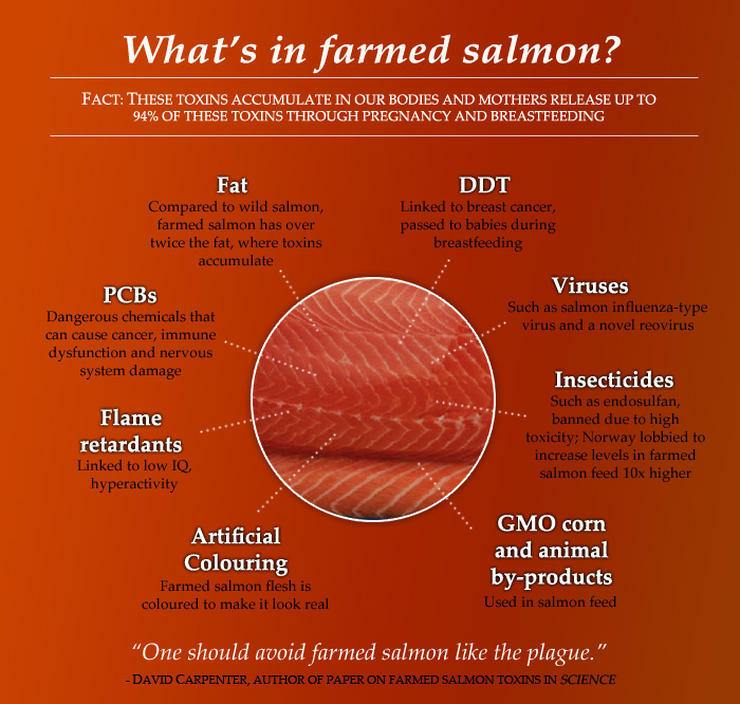 Instead, farmed salmon eat pellets containing synthetic antioxidants. Nowadays, most of the commercial astaxanthin for aquaculture is produced synthetically from toxic petrochemical sources, like coal (5). 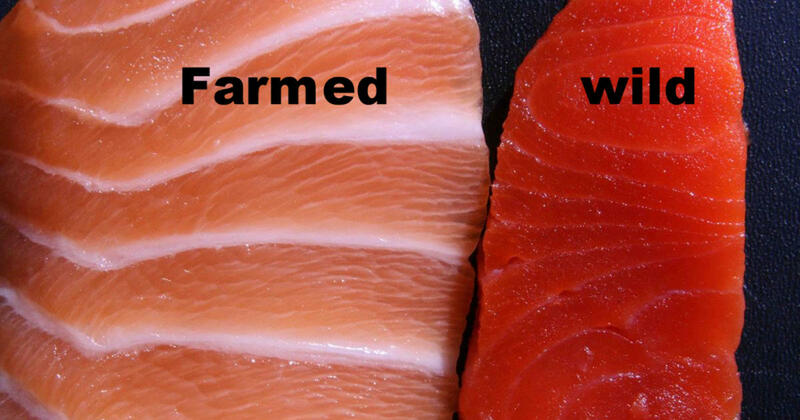 Here are some other differences between wild and farmed salmon. According to USDA data, wild salmon has fewer calories (about 130 cal less when comparing small cuts) and half the fat content of the same amount of farmed salmon (6,7). Persistent organic pollutants (POPs) are toxic chemicals that adversely affect human health and the environment around the world. They are absorbed and ingested by wildlife and pose a health threat to humans as well (8). POPs have been linked to several diseases, including type 2 diabetes and obesity (9). They can also increase the risk of stroke in women (10). Farmed fish are exposed to more environmental and chemical pollutants than their wild cousins (12). 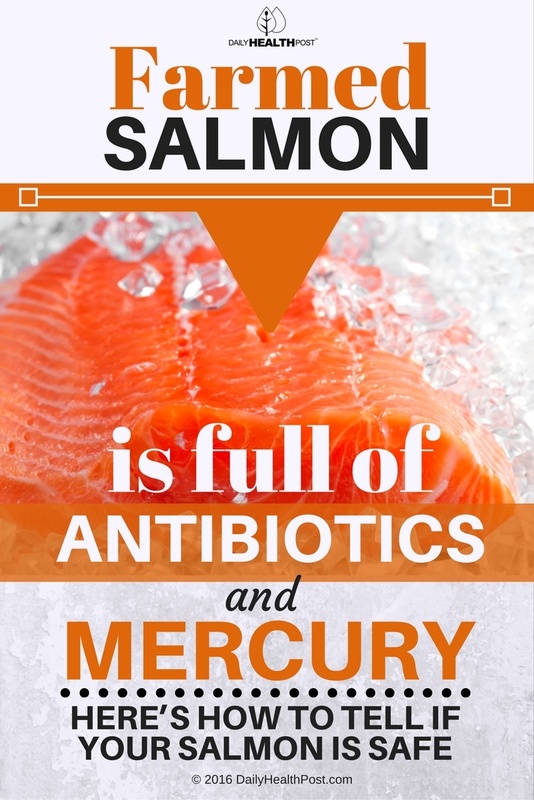 A 2005 study published in the Journal of the American Medical Association showed that the rate of cancer risk from consuming farmed salmon from certain regions is three times higher than wild salmon (13).